The owners of The Farm at High Shoals, the horse barn turned reception hall between Bishop and North High Shoals, filed an application for a business license last week, according to B.R. White, director of Oconee County Planning and Code Enforcement Department. That was more than a month after the Oconee County Board of Commissioners approved a rezone for just less than 5 acres, including the horse barn, to allow the owners of the 306-acre horse farm to continue to operate the reception hall business. The submittal of the application followed by a few days the Oct. 15 Stem & Stein fundraising event held by the Oconee Cultural Arts Foundation in the parking lot in front of the OCAF building and at the Oconee County School System offices in downtown Watkinsville. That event, formerly known as the OCAF Wine Festival, had been planned for The Farm but was moved after the county determined that its alcohol ordinance does not allow for temporary permits. The Laurie H. Rice Trust applied for the rezone to convert the 5 acres surrounding the horse barn from its agricultural classification to business on July 5. At the Oconee County Planning Commission meeting on Aug. 21, representatives of the Rice Trust said the owners had been using the barn as a reception hall for about two years. The Oconee County Board of Commissioners approved the rezone at its meeting on September 5. Planning Commission member Maria Caudill asked about fire and safety standards for the barn when that group reviewed the rezone request at its Aug. 21 meeting. As part of the business license application review, the facility also will have to be reviewed by the Oconee County Environmental Health Department. The structure was permitted as a stable with an apartment and completed in 2001. The Farm is located at 5414 High Shoals Road. 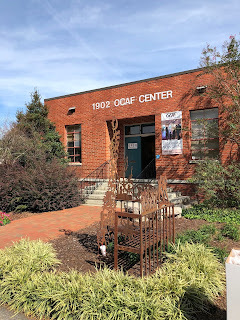 Neither the lack of a business license–technically an Occupational Tax Certificate–nor code standards were the reason OCAF moved the event from The Farm to its own parking lot. Alex Perschka, Oconee County Tourism director, sent County Clerk Kathy Hayes an email on Sept. 21 asking for Hayes’ help. Hayes administers the county’s alcohol ordinance. “Cindy Farley, the Executive Director at OCAF, reached out to me this morning needed a letter from the county,” Perschka wrote to Hayes. I had filed an open records request for correspondence on OCAF’s request. Once OCAF made the decision to return to within the city limits, it contacted Watkinsville City Clerk Julie Sanders for the letter for the Georgia Department of Revenue. Watkinsville Mayor Connie Massey sent Farley a letter on Sept. 22. The letter followed a template that Farley had given to Perschka and that was, Perschka said, based on OCAF’s experience with is annual Wine Tasting, held for the past 17 years on the grounds of Ashford Manor in Watkinsville. Ashford Manor has decided to no longer host this type of event. Hoops, hoops, and more hoops for reasonable, rational, and mature adults to have a wine-tasting. Welcome to the joys of regulation, where other people with a binder full of rules know better and pull rank. Easy solution: An Alcohol Ordinance that allows temporary permit applications.